Plain Language Summary: Snow clouds, which bring heavy snowfall to populated coastal plains, have been extensively studied by analyzing data acquired by aerological, meteorological satellite, and radar observations, or conducting numerical simulations. Because of the difficulties with accessing cloud systems over the ocean, however, few in situ observation data have been available, and up until the middle 1990s, many problems remained unsolved or their analysis and simulation results had not been validated. Here we review knowledge gained from instrumented aircraft observations, made from the middle 1990s through the early 2000s. The development of a convectively mixed boundary layer and cloud formation over the Sea of Japan are documented, mostly based on data collected by an extensive suite of instrumentation (in situ measurement probes, cloud radar, nadir-looking microwave radiometer, and GPS dropsonde) on G-II aircraft. Microphysical, thermodynamic, and kinematic structures of shallow convective snow bands are described on the basis of B200T instrumented aircraft and dual Doppler radar observations. Inner structures of well-developed JPCZ cloud bands with a W–E orientation are documented mainly on the basis of data collected by the extensive suite of instrumentation on G-II aircraft. Inner structures of polar low, which formed as a result of interaction between the flow field of a synoptic low and the topography of Japanese islands, are documented, mainly on the basis of data collected by the extensive suite of instrumentation on G-II aircraft, along with additional dropsonde soundings from the Citation V aircraft and radiosonde soundings from JMA observation vessels, along with special observation sites in coastal areas. Plain Language Summary: There is still a lot of uncertainty regarding the statistical characteristics of wind gusts. 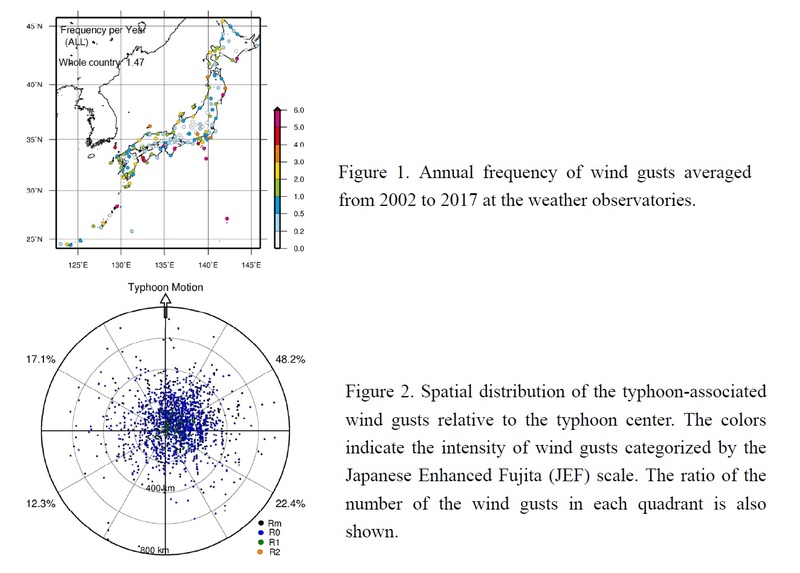 This study clarified the frequency and spatiotemporal distribution of wind gusts throughout Japan by statistically analyzing the surface observational data of the last 16 years. The frequency of wind gusts with more than 25 m s–1 averaged across all observatories is 0.97 per year, which is four or five orders of magnitude higher than the tornado encounter probability in Japan. 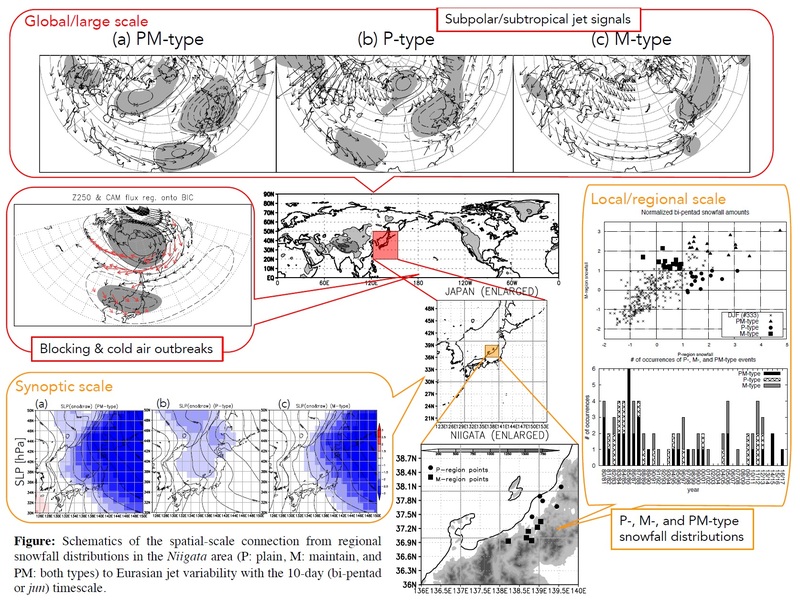 This study is the first to statistically analyze wind gusts using surface meteorological observations throughout Japan. The frequency of wind gusts averaged over all observatories is 1.47 per year (0.97 for wind gusts with more than 25 m s–1). The coastal regions experience an approximately threefold higher frequency of wind gusts than the inland areas (Fig. 1). The wind gusts have high activities during daytime, especially between 13:00 and 17:00 JST. Approximately half of the typhoon-associated wind gusts occur in the right-front quadrant of a typhoon with respect to the typhoon motion (Fig. 2). Plain Language Summary: On 8 June 2013, a strong southeasterly gale attacked Urumchi, the provincial capital of Xinjiang, China, giving rise to great damage. This work studies the formation of the gale incident according to observations and numerical simulation, suggesting the importance of topographic forcing of Tianshan Mountains. The southeasterly gale occurred at the northwest opening of Tianshan Grand Canyon. Its formation was closely related to the topographic forcing of Tianshan Mountains. 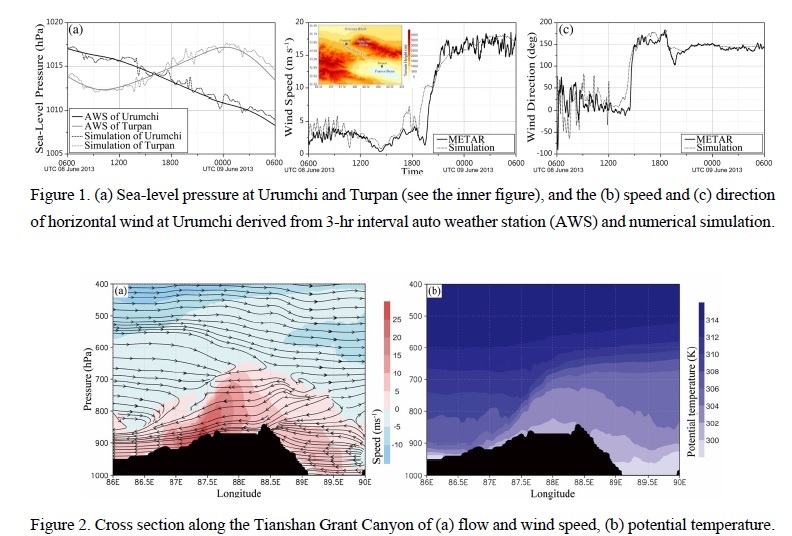 The intensification of pressure gradient across the Tianshan Grand Canyon was the advantageous condition for the generation of the southeasterly gale. Air current sank on the northwest opening of the canyon due to unstable stratification caused by nonlinear process and thus strengthened the gale. Nayak, S., and T. Takemi, 2019: Dynamical downscaling of Typhoon Lionrock (2016) for assessing the resulting hazards under global warming. J. Meteor. Soc. Japan, 97, 69-88. Plain Language Summary: Recent studies have revealed that typhoons will be stronger and more powerful in a future warmer climate and be a threat to lives and properties. The present study attempted to perform dynamical downscaling simulations of Typhoon Lionrock (2016) at 1-km grid resolution by using the Weather Research and Forecasting (WRF) model to discuss the track and intensity of this typhoon and associated precipitation amount in the target region after landfall in present climate and under Pseudo Global Warming (PGW) conditions. 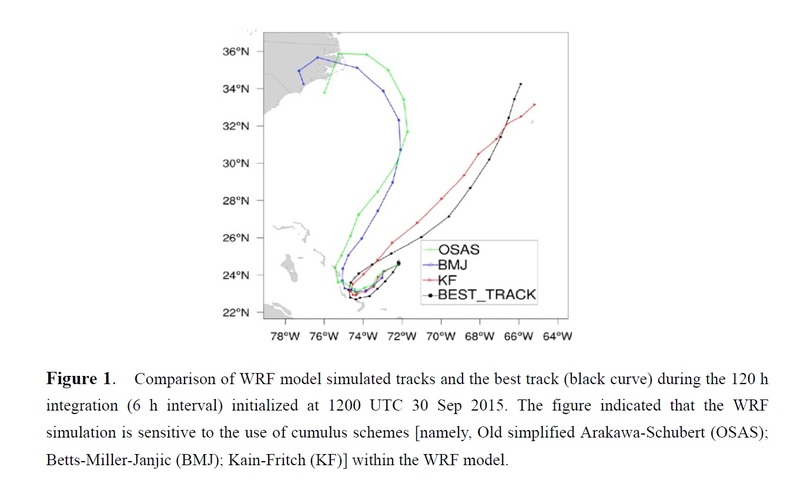 The downscaled simulations with WRF model reproduced a significant improvement in the track and intensity of the typhoon with respect to the original reanalysis datasets. The typhoon is projected to be stronger and more powerful under future warm climate. It is expected to produce more precipitation over Hokkaido and the entire Tohoku region in warming climate. The study suggests that the typhoons under PGW condition may increase the risk of flooding, damages to infrastructures, and lives staying along the typhoon track. Plain Language Summary: This study aimed to improve understanding of the differences in surface air temperature data between homogenized observations and reanalysis (20CR and ERA20C) since the beginning of the 20th century and to address the reanalysis data error. For ERA20C and 20CR, there was a high consistency with ADJ in annual variation characteristics after 1975. There were large fluctuations of REA during 1960–1970. The differences between 20CR and ADJ were large before the 1950s, and ERA20C was generally closer to ADJ. The annual variation characteristics of REA had a higher agreement with those of ADJ in winter and spring than in summer and autumn. 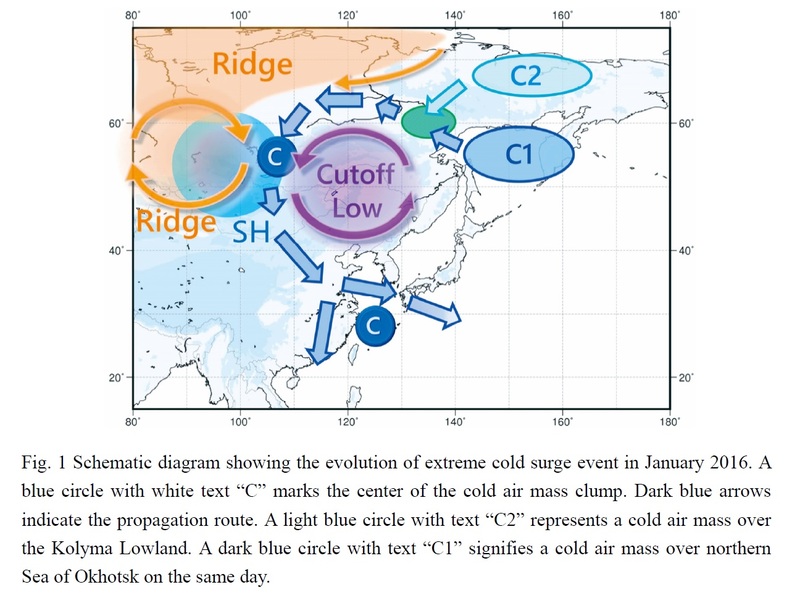 Plain Language Summary: To clarify how the low temperatures in winter nights form, we analyzed the effects of topography and boundary-layer wind on the temperature distribution and vertical profiles of boundary-layer atmospheric conditions of the Tokachi region for a winter night using numerical simulations. From the distribution of vapor mixing ratio, we revealed unique processes of the development of surface temperature distribution influenced by inversion layer formation and katabatic drainage flow (Figures 1 and 2). The effects of boundary-layer wind on the formation of high-temperature zones were generally confined to the northwestern part of the Tokachi Plain. Radiative cooling and sensible heat transfer by turbulent mixing in the surface layer do not adequately explain the temporal change in observed surface air temperatures. 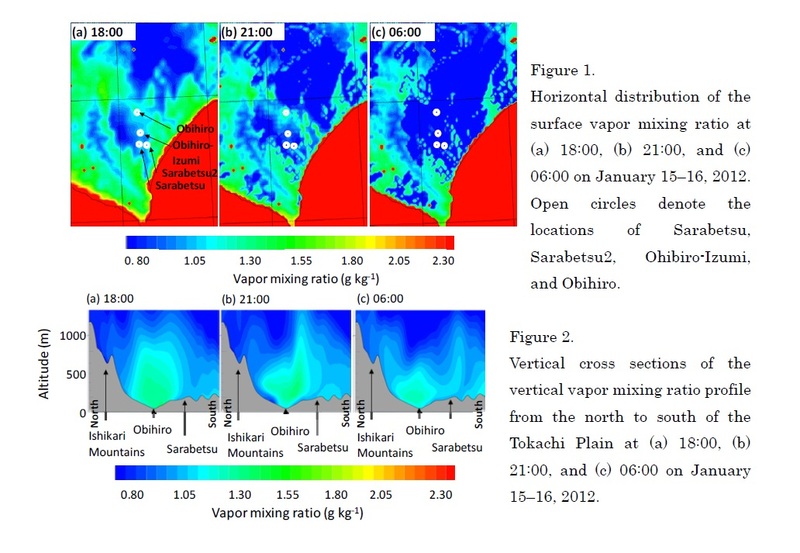 The development of inversion layer and katabatic drainage flow drastically change the temperature from southern Sarabetsu to Obihiro, despite of a moderately strong wind condition in the boundary layer. Plain Language Summary: We show a simple conceptual model of the resonant interaction in a typhoon-like vortex between vortex Rossby waves (VRWs) and gravity waves (GWs), which are caused by the VRWs. The proposed conceptual model is based onthe buoyancy-vorticity formulation (BV-thinking), and is different from that for the barotropic and baroclinic instabilities based on PV interactions (PV-thinking). We consider disturbances of the first baroclinic mode on a basic barotropic vortex. The disturbance vertical vorticity ζ of the VRW in the central region has a large amplitude on the upper and lower levels. The disturbance buoyancy b and radial vorticity η of the GW in the outer region have a large amplitude on the middle level. 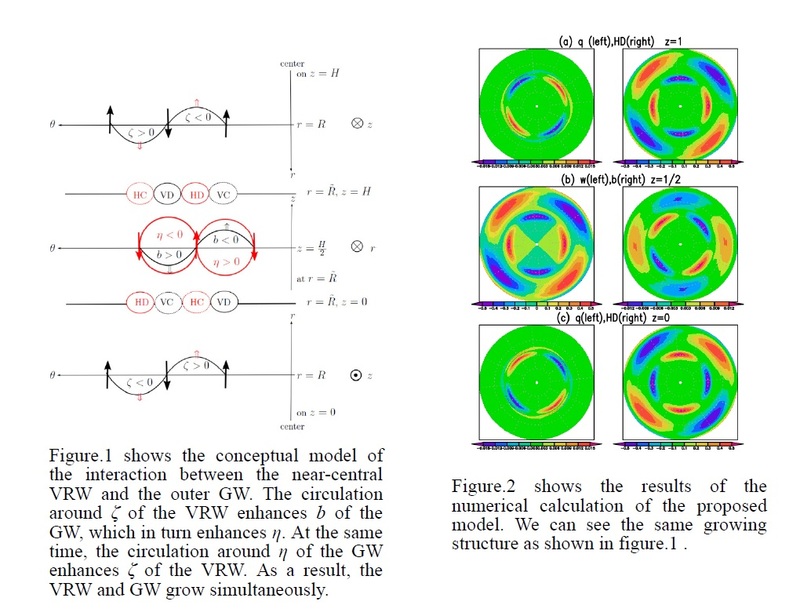 We propose the VRW-GW resonant growth mechanism in a three dimensional model not in a two dimensional model. The VRW-GW resonant growth occurs in a three dimensional system. This is because the growth is caused by the interaction between the horizontal circulation of VRW and the vertical circulation of GW. We also show the numerical calculation of the proposed model. Plain Language Summary: Previous studies projected future changes of precipitation extremes such as an annual maximum one-day precipitation total (Rx1d) itself. Thanks to large-ensemble simulations, we can now investigate projected future changes of extremes in once-in-a-10-year and once-in-a-100-year rare events. It is found that such a rare event will increase in a region extending from Hawaii to the south of Japan, implying an increasing risk of rare heavier rainfall events there by global warming. Future changes in precipitation extremes (Rx1d: annual maximum daily precipitation) and a role of tropical cyclones (TCs) are investigated by a large ensemble experiment, 6,000 years for the present and 5,400 years under +4 K warming, with a 60-km mesh MRI-AGCM3.2. The large ensemble size enables us to investigate changes in the tails of the Rx1d distribution. It is found that 90- and 99-percentile values of Rx1d associated with TCs will increase in a region extending from Hawaii to the south of Japan. In this region, interannual variability of Rx1d associated with TCs is also projected to increase, implying an increasing risk of rare heavier rainfall events by global warming. Plain Language Summary: The observed intensity changes of tropical cyclones (TCs) with concentric eyewalls (CEs) often varied case from case. This study establishes a relationship between intensity changes and CE patterns, and also shows the environmental influences on the configuration of different CE patterns. The results may be beneficial for forecasting intensity fluctuations of a TC with CE from the current environmental configurations. Definitions for CE patterns are summarized based on the CE structural evolution in microwave satellite observations from 1997 to 2011 in the western North Pacific. Statistical results showed that a TC will reach peak intensity around CE formation for one particular CE pattern, while it may intensify to the peak before CE formation for another CE pattern. The environmental configurations for the two CE patterns above are significantly different in the moisture inflows, the activities of low-level trough, the subtropical high, and the South Asia high, which are summarized in the three-dimensional conceptual models. Inatsu, M., H. Suzuki, and M. Kajino, 2019: Relative risk assessment for hypothetical radioactivity emission at a snow climate site. J. Meteor. Soc. Japan, 97, 175-190. Plain Language Summary: We assessed relative risk for hypothetical radioactivity emission from the Tomari Nuclear Power Plant in Hokkaido, Japan. With a brand-new risk evaluation method, we found that the risk was higher in the eastern part of the target area owing to the westerly flow. A set of atmospheric dispersion-deposition model integrations was conducted with a hypothetical emission of radioactive materials consisting of 137Cs, 131I, and 134Cs from the Tomari Nuclear Power Plant in Hokkaido, Japan, which is a snow climate site. Each integration was driven by Japan Meteorological Agency’s meso-scale model analysis data with 5-km horizontal resolution. The initial conditions were those on each day from January 2010 to December 2016 and the integration period was at most 4 days. The target was the area within 30 km of the plant. Extending a unit-mass emission concept, the measure of relative risk is the probability of exceeding the threshold of the maximum effective dose rate based only on exposure from groundshine. Considering that the measure increased monotonically with the ratio of the total emission amount to the threshold, we evaluated the probabilistic risk with its median. Figure 1 suggested that the risk was higher in the eastern part of the target area owing to the prevailing westerly flow. The frequent snowfall in winter drags radioactive materials down in the target region, even under an active turbulent condition with strong vertical shear. The composite analysis of wind direction averaged over the target area revealed that the risk was high in the leeside, but that mountains effectively blocked the inflow of the radioactive materials. Plain Language Summary: This study investigated the relationships between well-known dominant regional snowfall distributions in the Niigata area, intraseasonal jet variability over Eurasia, and atmospheric blocking. Snowfalls in plain (P-type), mountainous (M-type), and the whole (PM-type) areas of Niigata were controlled by quasi-stationary Rossby waves along the subpolar, subtropical, and both jets, respectively. Blocking over the Siberian regions enhanced cold air outbreaks intruding toward Japan and contributed the P-, M-, and PM-type snowfalls. We focused on P-, M-, and PM-type snowfall variations in 10-day (bi-pentad or jun) timescale associated with anomalous large-scale circulations. Local snowfall distributions (10–102 km) can be determined by different large-scale (103–104 km) atmospheric circulations, which were evidently distinguished in the global reanalysis data. Quasi-stationary Rossby-wave packets along the subpolar and subtropical jets and Siberian blocking collaboratively or often independently contributed to the P-, M-, and PM-type snowfall occurrences. Plain Language Summary: This study aims to investigate the potential impact of surface observations with a high spatial and temporal density on a local heavy rainstorm case that caused five fatalities in Kobe, Japan on July 28, 2008. The control experiment (CTRL) assimilates only the phased array weather radar (PAWR) data, and two sensitivity experiments are performed to investigate the impact of additional surface observations obtained every minute at 8 (S8) and 167 (S167) stations in Kobe. The results show that the dense and frequent surface observations have a significant positive impact on the analyses and forecasts of the local heavy rainstorm (Fig. 1). The dense and frequent surface data assimilation improved analyses and forecasts of surface temperature, moisture and convergence. The number of the surface data is relatively small, but they provide important observations about lower atmospheric conditions that are generally more difficult to observe by remote sensing instruments. Plain Language Summary: An extreme cold surge event occurred in January 2016 was studied by means of the isentropic cold airmass analysis method. We traced the cold air masses below a potential temperature of 280K more than a week, and found that a clump of thick cold air masses gathered on the eastern Siberia, moved to Lake Baikal, and then spilled southeastward over East Asia. The cold air mass is blown by the circulation related with two ridges, cutoff low, and surface intense Siberian High. The time evolution of cold air mass is dominated by adiabatic processes, especially advection, when moving over the continent. The abnormality of the cold air mass thickness increases considerably as cold air mass migrates southward, although the thickness itself shows slight change, suggesting that the normal cold air mass from the Sea of Okhotsk and northeastern Siberia becomes abnormal during westward and strong southward migration. Plain Language Summary: This study examines the theoretically estimated predictability and practical prediction skill of the he East Asia and western North Pacific boreal summer intra-seasonal oscillation (BSISO) in the Beijing Climate Center Climate System Model (BCC_CSM2.0). Results show that the prediction skill and predictability of BSISO in BCC_CSM2.0 are 14 and 24-28 days respectively. The model shows a strong dependence on initial/target BSISO phase and amplitude. 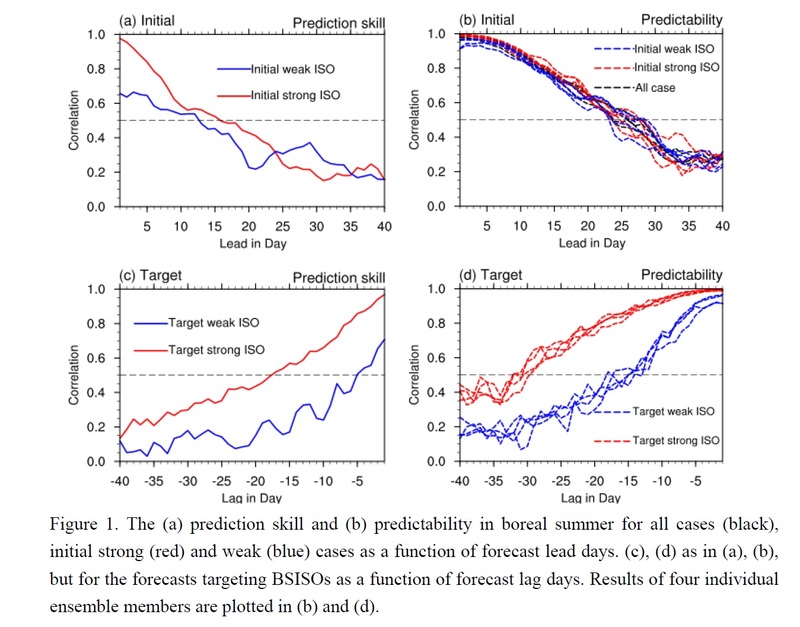 14-year hindcast experiments initialized with 5-day interval and 4–member ensemble indicate that prediction skill and predictability of BSISO are about 14 and 24-28 days respectively. 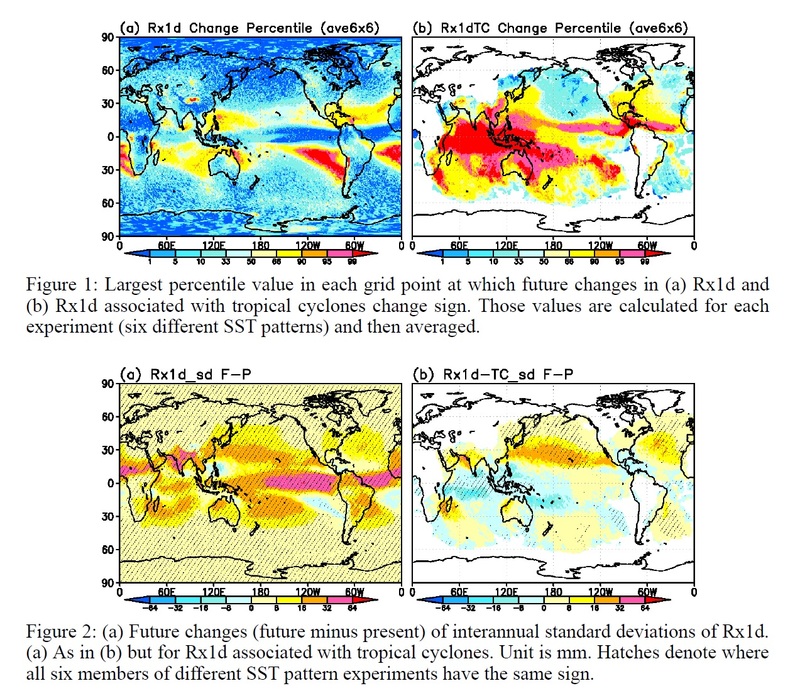 Relatively higher prediction skill is found for the initially/target strong BSISO cases, while lower skill occurs when the BSISO-related rain-band propagates northward from the western North Pacific to the East Asia. Systematic errors are found such as underestimation of BSISO amplitude and faster phase speed. Plain Language Summary: Global warming experiments using three different 60 km-mesh atmospheric global circulation models are studied to characterize future changes in monthly East Asian precipitation for June to August. 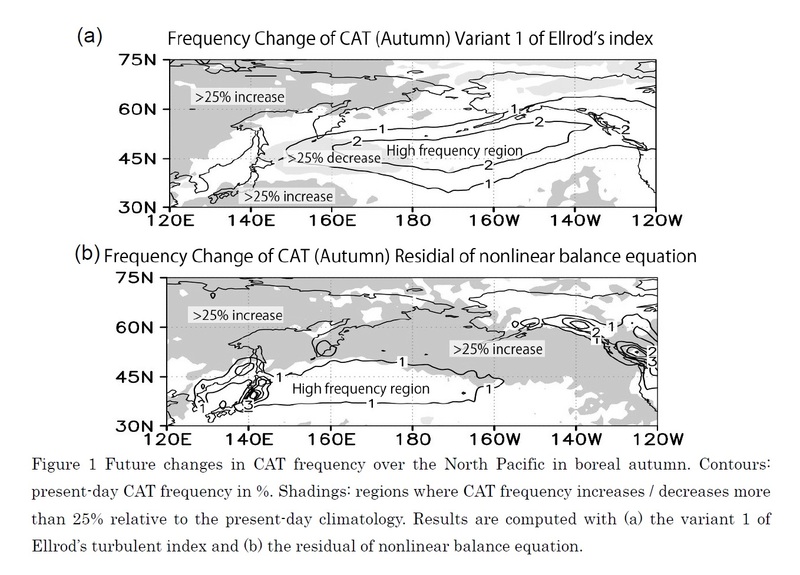 Wetting and drying effects due to changes in mean vertical motion are related adiabatically to the projected modification of 500 hPa horizontal atmospheric circulation, which is characterized by two cyclonic circulation anomalies extending over the eastern Eurasian Continent (C1) and the western North Pacific Ocean (C2) for each month (Figure 1). 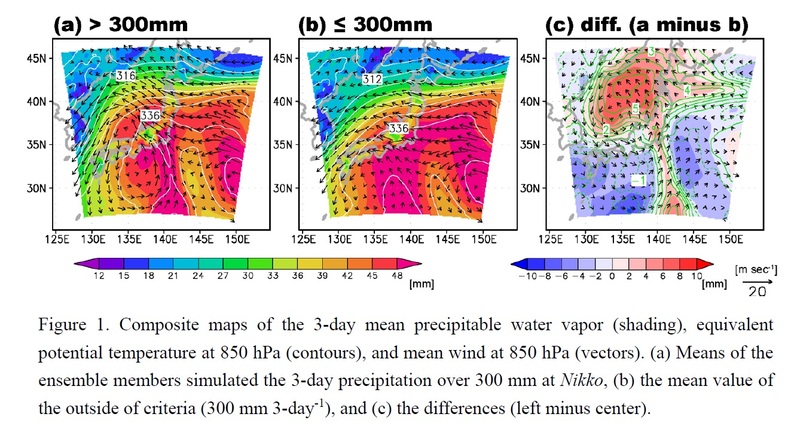 Most regions of Japan lie within the northeasterly wind and associated downward motion zones of C2, leading to significant uncertainties in the future precipitation over Japan by the offset against the "wet-get-wetter" effect and possibly leading to even a future decrease in precipitation. 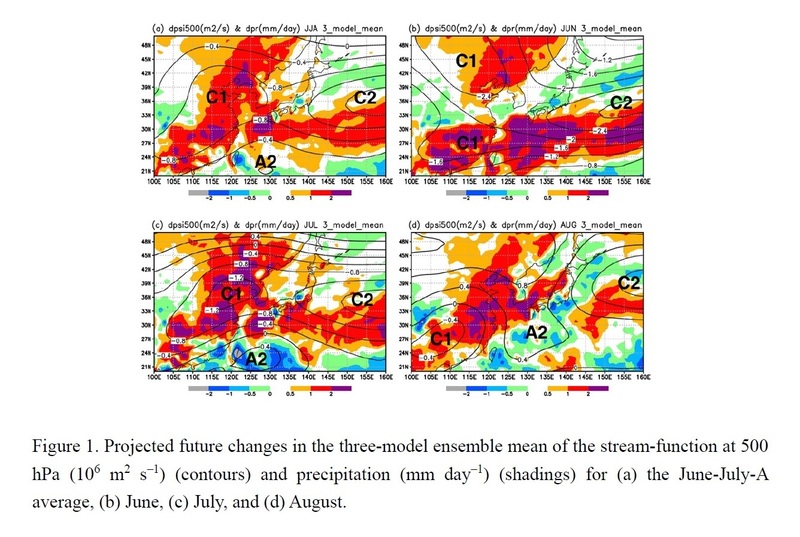 A wetter future climate is anticipated under weak subsidence or the upward vertical motion zone of C1 and C2, such as western Japan in August and the Southwest Islands of Japan in June. Plain Language Summary: A regional meteorology – chemistry model (NHM-Chem) has been developed for various operational and research purposes such as simulations of oxidant, Kosa, PM2.5, contaminations of land and ocean ecosystems, and aerosol size and chemistry both of which are important for health and regional climate change. In order to consistently evaluate the model performance, the simulated results need to be verified from various aspects. 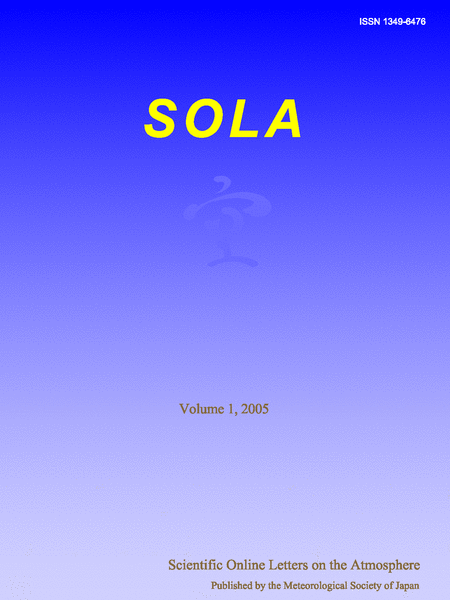 Methods to evaluate the model are suggested and the results obtained from the evaluation are presented in the paper. 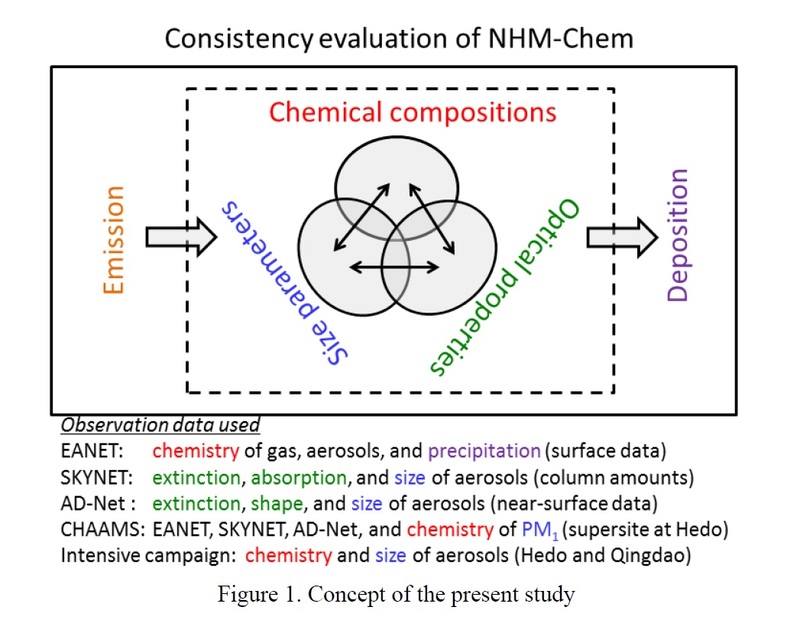 Presented are consistent evaluation methods of NHM-Chem, which comprises of three aerosol schemes, developed for regional climate study, air quality study, and operational forecast. Simulated mass, size, and deposition of SO42- and NH4+ agreed well, whereas those of NO3-, sea-salt, and dust needed improvement. Simulated near-surface optical properties of spherical particles agreed well, whereas those of column amounts and near-surface optical properties of dust needed improvement. 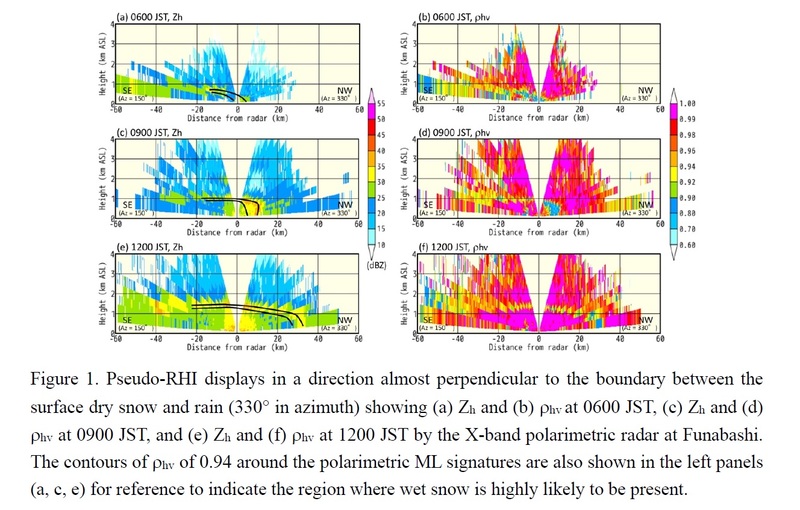 Plain Language Summary: This study describes the spatial distribution of the melting layer (ML) in a winter stratiform precipitation system associated with a south-coast cyclone over the Kanto Plain using an X-band polarimetric radar at Funabashi. The detailed horizontal distribution of surface precipitation types based on weather reports from citizens was also investigated in relation to the ML structure. This study revealed the unique structure of the ML associated with a cold air mass in the lower atmosphere and suggested that the detection of the ML using polarimetric radars is effective for determining surface rainfall and snowfall areas. According to the weather reports, a clear boundary line between the surface dry snow and rain areas was present from the eastern part of Kanagawa to the northwestern part of Chiba during the mature snowfall period around Tokyo. The polarimetric ML signatures continuously observed above the rainfall area in the southeast of the Kanto Plain and approached the ground near the surface dry snow–rain boundary. The ML vertically extended below 1 km ASL near the surface dry snow–rain boundary, which indicates the presence of a local horizontal temperature gradient associated with a cold air mass in the lower atmosphere. 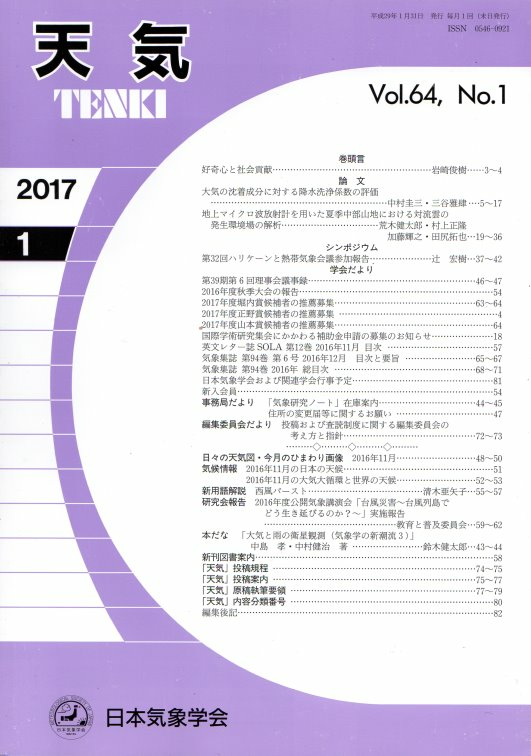 Fujita, M., T. Sato, T. J. Yamada, S. Kawazoe, M. Nakano, and K. Ito, 2019: Analyses of extreme precipitation associated with the Kinugawa River flood in September 2015 using a large ensemble downscaling experiment. J. Meteor. Soc. Japan, 97, 387-401. 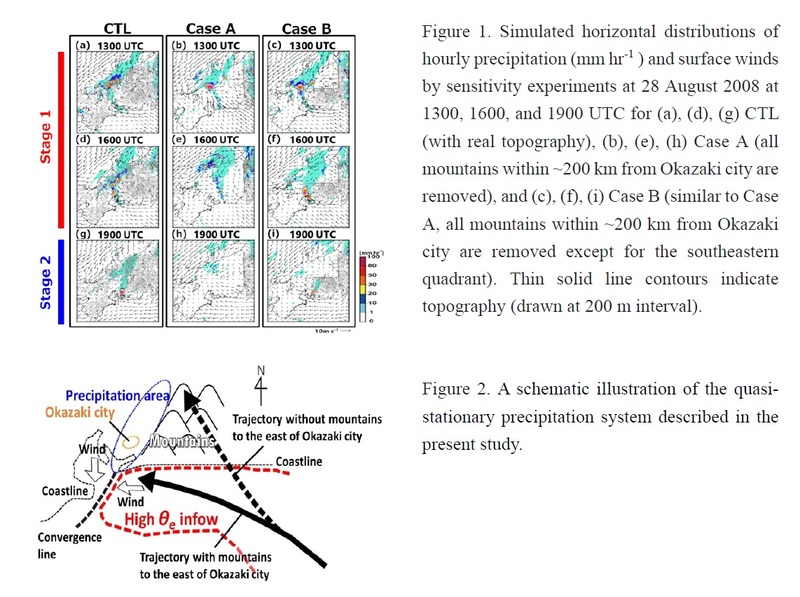 Plain Language Summary: We investigated extremely heavy precipitation that occurred around the Kinugawa River, Japan, in September 2015, and the probability of extreme precipitation occurrence, using data from a large ensemble forecast of more than 1,000 members that were dynamically downscaled to 1.6 km horizontal grid spacing. This extreme precipitation event occurred under specific conditions: two coexisting typhoons at close proximity that produced a high atmospheric instability, and water vapor transported from the Pacific Ocean. The observed event was statistically rare among simulated cases and the 3-day accumulated precipitation around Nikko was equivalent to the 95th percentile among all simulated ensemble members (1029 members). This extreme precipitation event occurred under specific conditions: two coexisting typhoons at close proximity that produced a high atmospheric instability, and water vapor transported from the Pacific Ocean. The large-ensemble downscaled data used hence enabled us to evaluate the occurrence probability of a torrential rainfall event that was rarely observed, which may contribute to updating a disaster-mitigating plan for possible similar disasters in future. Plain Language Summary: Aircraft making landing and takeoff at Narita International Airport in Japan frequently report low-level wind shear (LLWS) with turbulence when the prevailing wind is southwesterly, which is crosswind to the runway direction. 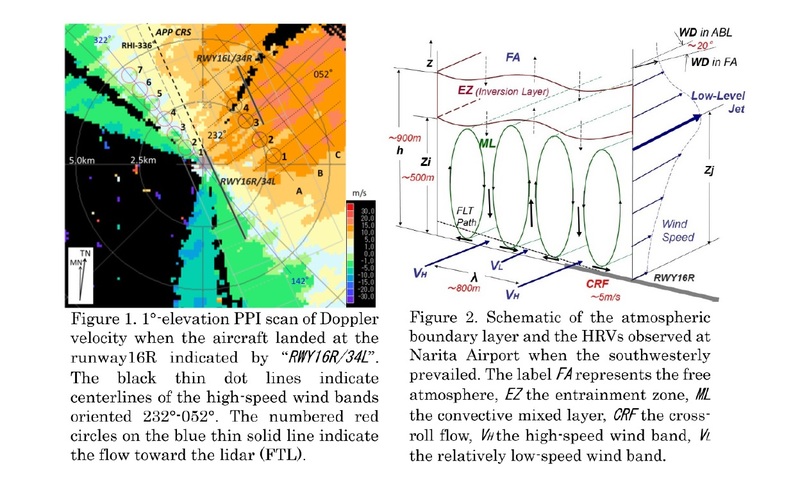 This study used observational data by a landing aircraft at the runway 16R and a single-Doppler lidar to demonstrate the existence and structure of horizontal roll vortices (HRVs) causing the LLWS encountered by the aircraft. A single-Doppler lidar detected various features of the HRVs such as high-speed wind bands, cross-roll flows (CRFs) perpendicular to the roll axes, and bands of Doppler spectrum width (DSW) minimum. The CRFs formed the LLWS in the scale of about 400m between the runway threshold and the touch down point. The bands of DSW minimum with high-speed wind may be used as indicators of downdrafts in the HRVs since the downdrafts transport less turbulent air with large momentum of the low-level jet in the upper convective mixed layer. Plain Language Summary: In situ observations to capture atmospheric responses to the Oyashio (or subarctic) sea surface temperature (SST) front had not been carried out. Our intensive observations showed clear contrasts in the low-level atmosphere and cloud across the Oyashio front. Furthermore, we observed narrow, warm ocean areas with a width of a few kilometers and their effects on the atmosphere. 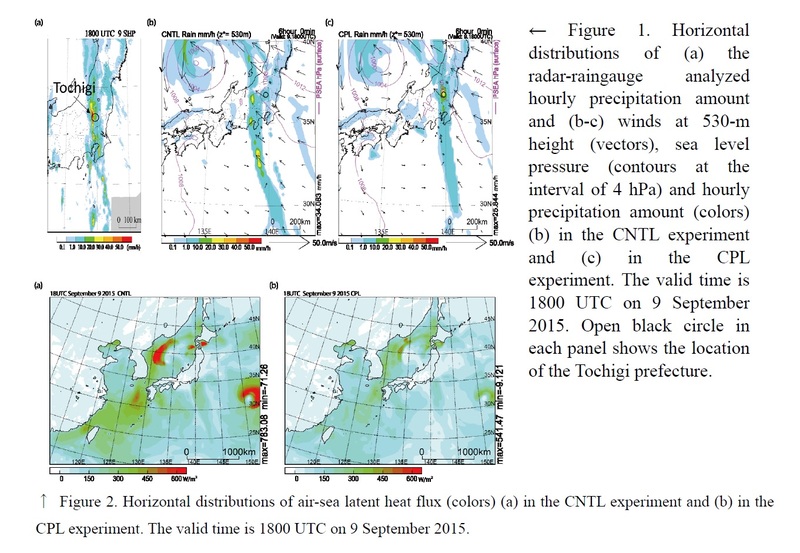 In situ observations corroborated contrasts in the atmospheric marine boundary layer and cloud base height between the warm and cold sides of the Oyashio front. Sea level pressure anomaly caused by horizontal differential heating from the sea surface across the Oyashio front was estimated to at 1.2 hPa. Warm ocean streamers with a width of a few tens kilometers also significantly affected the atmosphere. 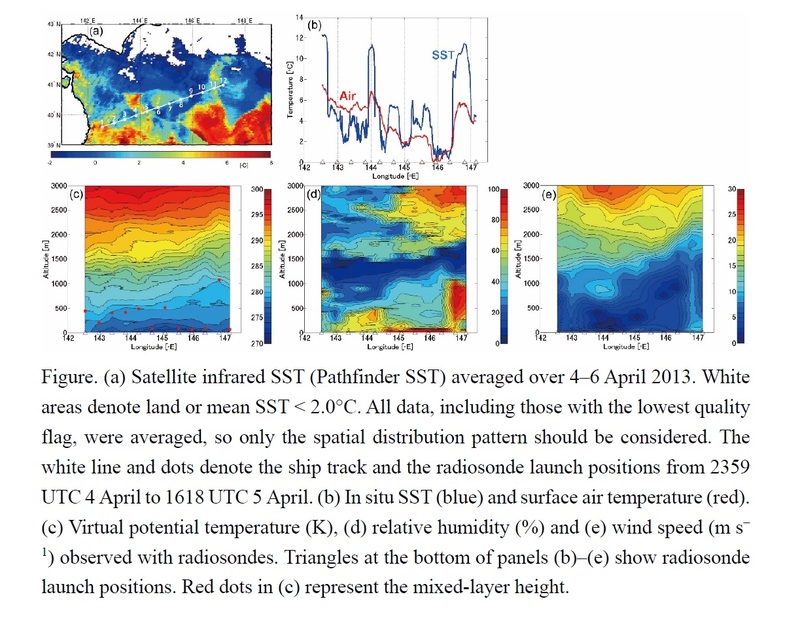 Fudeyasu, H., and R. Yoshida, 2019: Statistical analysis of the relationship between upper tropospheric cold lows and tropical cyclone genesis over the western North Pacific. J. Meteor. Soc. Japan, 97, 439-451. Plain Language Summary: This study examined the statistical characteristics of tropical cyclones (TCs) for which the cyclogenesis (TCG) process was modulated by upper tropospheric cold lows (UCLs) over the western North Pacific during the 38 years from 1979 to 2016. 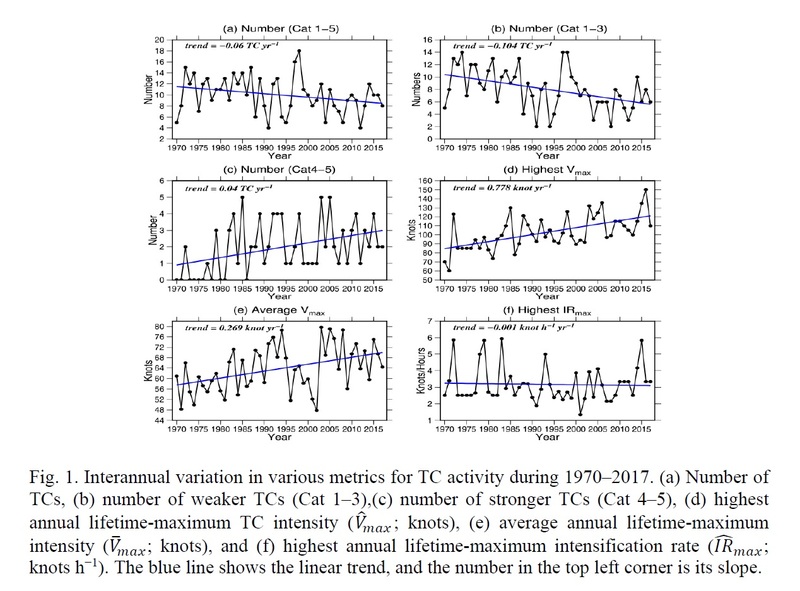 Most TCs having TCG influenced by UCLs in the northwest quadrant of the TC region (UL-TCs) occurred in the summer, with large variability in the annual occurrence rate of UL-TCs during June to October, ranging from 0 to approximately 30%. The annual variation was related to the activity of the Tibetan high and the summer temperature anomaly over Japan. The UL-TCs at the time of TCG were more favorable for the development of TCs. In contrast, the atmospheric and oceanic environmental parameters around UL-TCs at the time of tropical storm formation (TSF) were less favorable for the development of TSs, such that UL-TCs tended to remain at weak in intensity. UL-TCs tended to remain at weak intensity, and rarely developed into intense TCs. UL-TCs tended to move northward at the time of TSF. The occurrence rate of UL-TCs that made landfall in Japan was approximately double that in other countries. Many UL-TCs in lower tropospheric environments were associated with the shear line (SL), confluence region (CR). 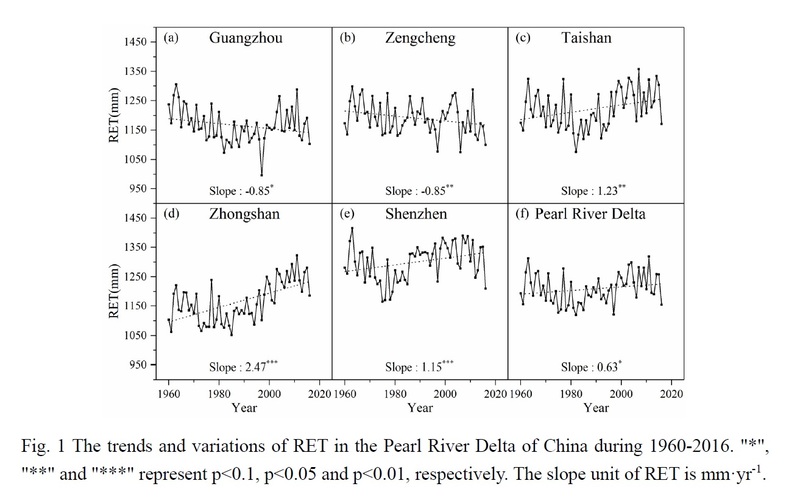 Plain Language Summary: This study aimed to answer the question: what are the dominant factors affecting the variations of reference evapotranspiration (RET) in the Pearl River Delta of China? Our results indicated that the land use change-induced shifts in surface albedo were responsible for RET variations. Besides, the roles of climatic factors varied across sub-regions. The changes in sunshine duration and wind speed were the two dominant factors in decreasing RET in Guangzhou and Zengcheng, whereas the variations of temperature and relative humidity were responsible for RET increase in Taishan, Zhongshan and Shenzhen, respectively. The increase of surface albedo due to the conversion of woodland to grassland decreased RET remarkably. The decrease of net radiation due to the declined sunshine duration and the weakening of energy exchange due to the decreased net radiation were the two dominant factors in reducing RET in Guangzhou and Zengcheng. The increase of vapor pressure deficit due to changes in daily maximum and minimum temperatures as well as daily relative humidity were responsible for RET increase in Taishan, Zhongshan and Shenzhen. Plain Language Summary: This study investigates the dynamical downscaling simulation and future projection of extreme precipitation activities (including intensity and frequency) in Taiwan during the Mei-Yu seasons (May and June). The future projections show that extreme precipitation will become more frequent and more intense over western Taiwan, but less frequent and less intense over eastern Taiwan. Further examinations of the significance of the projected changes in extreme precipitation that affect the agriculture regions of Taiwan show that the southwestern agriculture regions will be affected by extreme precipitation events more frequently and more intensely than the other subregions. 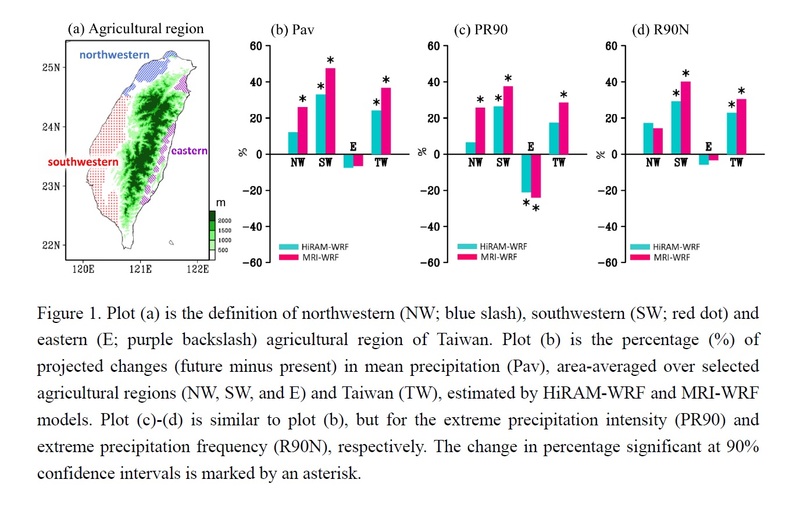 This is the first study to present the regional difference in the projected changes of Mei-Yu season extreme precipitation with a focus over the agricultural regions of Taiwan. The regional difference in the projected changes of extreme precipitation over Taiwan is found to be a local response to the future changes of low-level wind circulation and moisture convergence over the East-Asian monsoon region. Plain Language Summary: During summertime in Taipei, the afternoon thunderstorms usually occur at the south of Taipei basin, a signal of precipitation hotspot. The idealized simulations show that the local circulation is a key for the hotspots. The two valleys guide background southwesterly flow along with the sea breezes to penetrate the basin. The urban heat island effect enhances the sea breeze convergence at the south of the basin and produces strong convection there. Besides, the background wind direction is essential in determining the location of sea breeze convergence. If the background wind direction changes from westerly to west-northwesterly, there might be no precipitation at all in the basin. Idealized experiments are designed to understand the essential mechanism for precipitation hotspots (PHs) in Taipei basin. The results show that the local circulation is a key for PHs at the south of the Taipei Basin. The background wind direction is essential in determining the location of sea breeze convergence, hence the PHs. Plain Language Summary: A new method for detecting tropical cyclones in high-resolution climate model simulations is proposed. The proposed method utilizes a two-dimensional scatterplot based on two quantities that represent the radial gradient and the tangential asymmetry of mid-to upper-level thickness around a simulated vortex. A comparison between the modeled and observed tropical cyclones over a part of the western North Pacific near Japan shows promising results. The detection method is only weakly dependent on the horizontal resolution. A new method for detecting tropical cyclones in high-resolution climate model simulations is proposed. A comparison between the modeled and observed tropical cyclones using the non-hydrostatic regional climate model (NHRCM) with 20-km grid spacing under reanalysis-driven boundary conditions for one year revealed that no cyclones are missed and there is only one false alarm over a part of the western North Pacific near Japan. 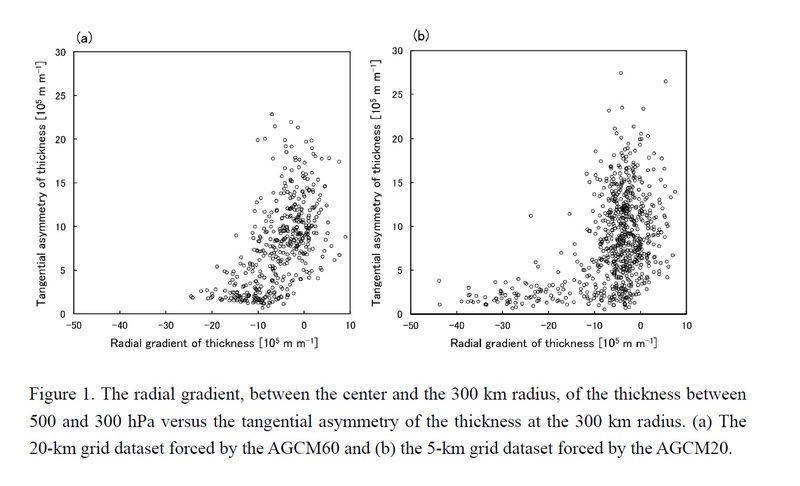 A comparison of the results obtained from datasets with 5-km and 20-km grid spacing demonstrated that the proposed method is only weakly dependent on the horizontal resolution. 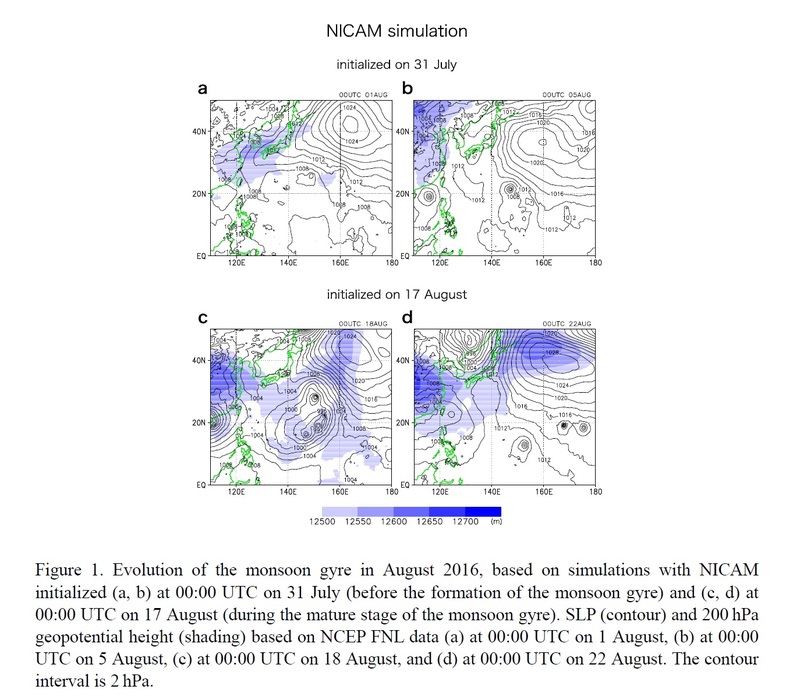 Plain Language Summary: A series of hindcast simulations were performed using the nonhydrostatic icosahedral atmospheric model (NICAM) to reproduce the temporal evolution of the monsoon gyre in August 2016. The simulations that were initiated at dates during the mature stage of the monsoon gyre successfully reproduced its termination and the subsequent intensification of the Bonin high, whereas the simulations initiated before the formation and during the developing stage of the gyre failed to reproduce subsequent gyre evolution even at a short lead time. In August 2016, a monsoon gyre persisted over the western North Pacific and was associated with the genesis of multiple devastating tropical cyclones. The experiments suggest a possibility that the development of the Bonin high is related to the termination of the monsoon gyre. Koralegedara, S. B., C.-Y. 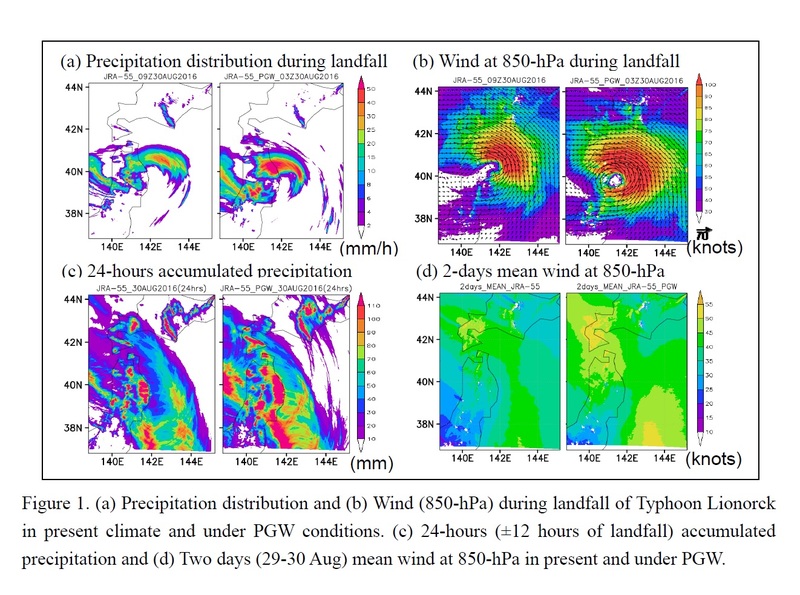 Lin, and Y.-F. Sheng, 2019: Numerical analysis of the mesoscale dynamics of an extreme rainfall and flood event in Sri Lanka in May 2016. J. Meteor. Soc. Japan, 97, https://doi.org/10.2151/jmsj.2019-046. Plain Language Summary: Sri Lanka frequently experiences extreme rainfalls under the influences of monsoon system and atmospheric disturbances from the Bay of Bengal (BoB) in India Ocean. 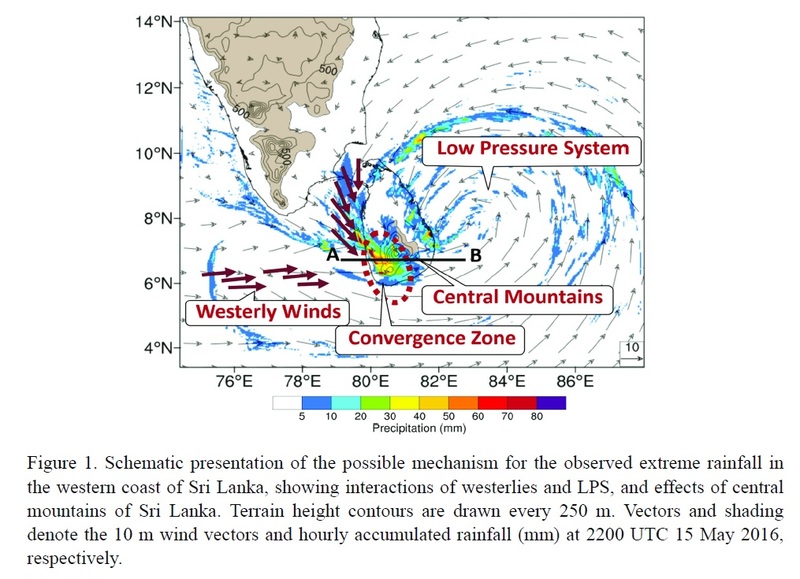 However, detailed analyses on both the synoptic and mesoscale dynamics in extreme events in Sri Lanka using numerical model are rare. This extreme rainfall event occurred as the cumulative effect of a sustained low-level convergence zone generated by an enhanced westerly monsoon flow and the circulation of the low pressure system (LPS) alongside a continuous supply of high-magnitude moisture, strong vertical motion, and orographic effects of the Central Mountains of Sri Lanka. This study numerically simulated and examined the mechanism behind the heavy rainfall event that occurred in Sri Lanka from 14–17 May 2016. The results indicated that the observed extreme rainfall event over the western part of the island was the result of interactions among the following phenomena: 1). the LPS in the BoB, 2). moisture-rich westerlies from the Indian Ocean and the Arabian Sea, 3) persistent low-level convergence and 4). the orographic effect from the Central Mountains of Sri Lanka. 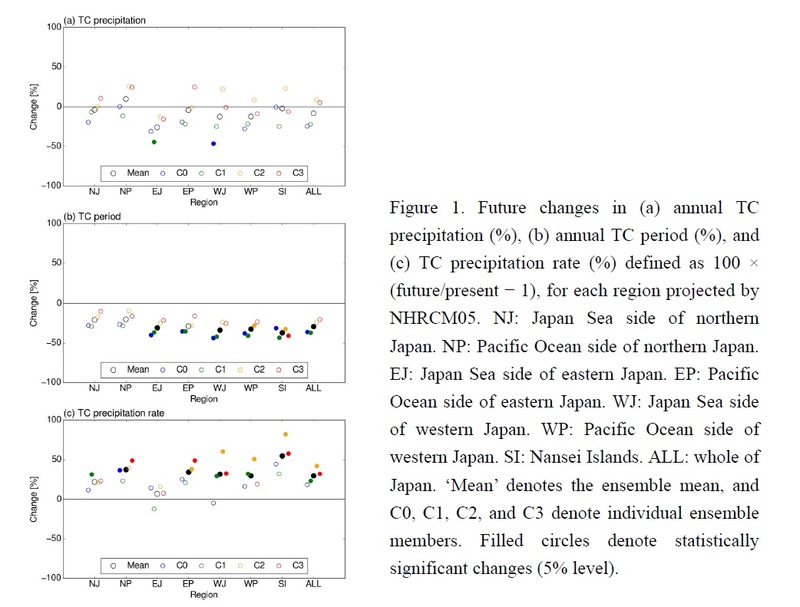 Watanabe, S. I., A. Murata, H. Sasaki, H. Kawase, and M. Nosaka, 2019: Future projection of tropical cyclone precipitation over Japan with a high-resolution regional climate model. J. Meteor. Soc. Japan, 97, https://doi.org/10.2151/jmsj.2019-045. Plain Language Summary: This study evaluated future changes in tropical cyclone (TC) precipitation over Japan using an ensemble projection generated by a non-hydrostatic regional climate model with a horizontal resolution of 5 km (NHRCM05). The total TC precipitation does not change significantly, while the frequency of extreme TC precipitation increases due to the intensification of TC precipitation rate. The increase of water vapor and the intensification and structural changes of the TCs contribute to the increase of TC precipitation rate. NHRCM05 reproduces TC precipitation and TC intensity more accurately than a general circulation model with a horizontal resolution of 20 km. The total TC precipitation shows no significant change due to a balance between a reduction of TC approaching Japan and an increase of TC precipitation rate. The frequency of extreme TC precipitation increases significantly because the intensification of the TC precipitation rate overcomes the reduction of TC number. Liu, B., C. Zhu, J. Su, S. Ma, and K. Xu, 2019: Record-breaking northward shift of the western North Pacific Subtropical High in July 2018. J. Meteor. Soc. Japan, 97, https://doi.org/10.2151/jmsj.2019-047. Plain Language Summary: The northward shift of the western North Pacific Subtropical High (WNPSH) in July 2018 broke the historical record since 1958. The present work attributes the extreme WNPSH anomaly to the strongest positive tri-pole pattern of sea surface temperature anomaly (SSTA) in the North Atlantic. This SSTA could induce an eastward propagating wave-train over the Eurasian Continent and enhance the atmospheric diabatic heating over the eastern Tibetan Plateau to cause the extreme northward shift of the WNPSH, finally leading to the extreme heat waves and casualties across Northeast Asia (NEA), especially over the southern Japan. The poleward shift of WNPSH reached 40°N in July 2018 and broke the historical records since 1958. The extreme WNPSH anomaly was linked to the strongest positive tri-pole pattern of SSTA in the North Atlantic. 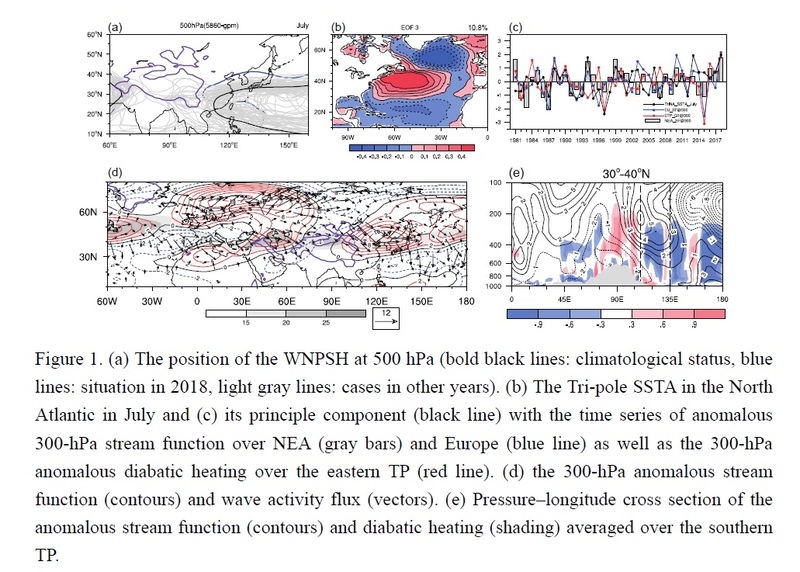 The SSTA in the North Atlantic induced a wave-source over Europe, enhanced the diabatic heating over the eastern Tibetan Plateau, and finally resulted in the extreme WNPSH anomaly. Xin, X., M. Wei, Q. Li, W. Zhou, Y. Luo, and Z. Zhao, 2019: Decadal prediction skill of BCC-CSM1.1 with different initialization strategies. J. Meteor. Soc. Japan, 97, https://doi.org/10.2151/jmsj.2019-043. Plain Language Summary: Two sets of decadal prediction experiments were performed with BCC-CSM1.1 with the ocean temperature relaxed toward SODA reanalysis data (SODAInit) and the ocean temperature data generated with EnOI method (EnOI_HadInit), respectively. 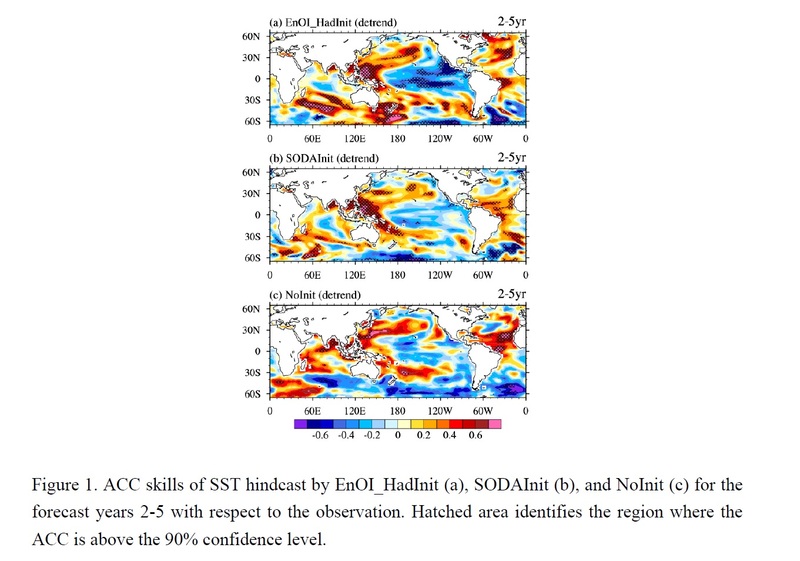 EnOI_HadInit is shown to be more skillful than SODAInit in predicting SST over the North Pacific, the southern Indian Ocean, and the North Atlantic. 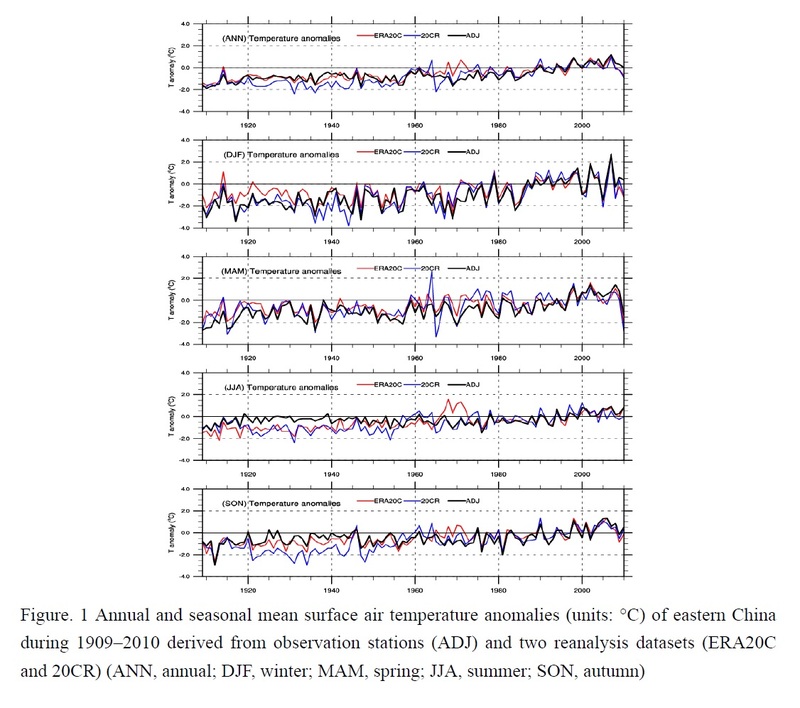 Improved prediction skill of surface air temperature is found over South Europe, North Africa, and Greenland associated with the skillful prediction of the Atlantic multi-decadal oscillation (AMO) in EnOI_HadInit. 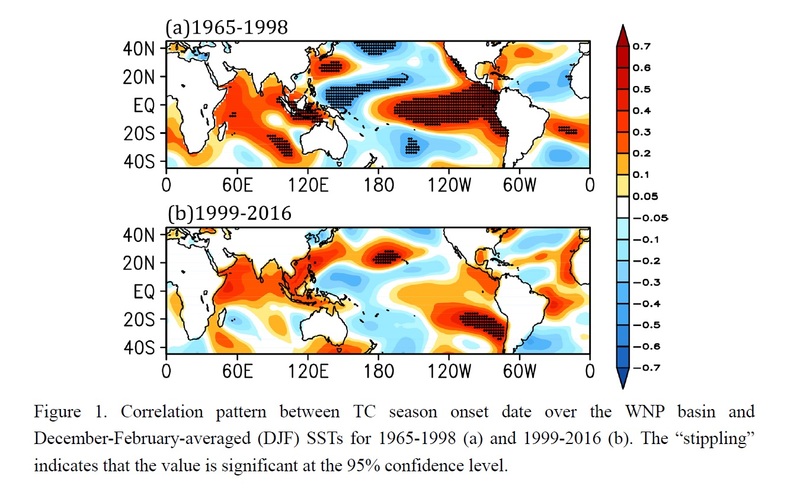 Decadal prediction using the EnOI method in the initialization is shown to have higher skill in predicting SST over the North Pacific, the southern Indian Ocean, and the North Atlantic. Improved prediction skill of surface air temperature (SAT) is found over South Europe, North Africa, and Greenland associated with the higher skill of AMO in the EnOI_HadInit. EnOI_HadInit and SODAInit are both skillful in predicting East Asian SAT, which is related to their skillful predictions of the tropical western Pacific SST. Tauvale, L., and K. Tsuboki, 2019: Characteristics of tropical cyclones in the Southwest Pacific. J. Meteor. Soc. Japan, 97, https://doi.org/10.2151/jmsj.2019-042. Plain Language Summary: In the Southwest Pacific, the annual number of tropical cyclones (TCs) and TC days decreased over the study period, while the numbers of stronger TCs slightly increased, and stronger TC days increased. The highest annual lifetime-maximum intensity and average annual lifetime-maximum intensity also increased. Small trends were found in genesis latitude, Vmax latitude, highest intensification rate, accumulated cyclone energy (ACE), and power dissipation index (PDI) suggesting that the Southwest Pacific region is likely to remain most vulnerable to such TC impacts at irregular interannual periods. TC activity in the Southwest Pacific are somewhat consistent with theoretical expectations of the change in TC activity under climate change, particularly in TC overall frequency and highest annual lifetime-maximum TC intensity. The latitudes of both TC genesis and Vmax remained almost unchanged over the 1970. 2017 study period, which suggests little shift in the dominant areas affected by TCs. The Sea Surface Temperature (SST) may contribute to the uppermost TC intensity and fewer TC days. 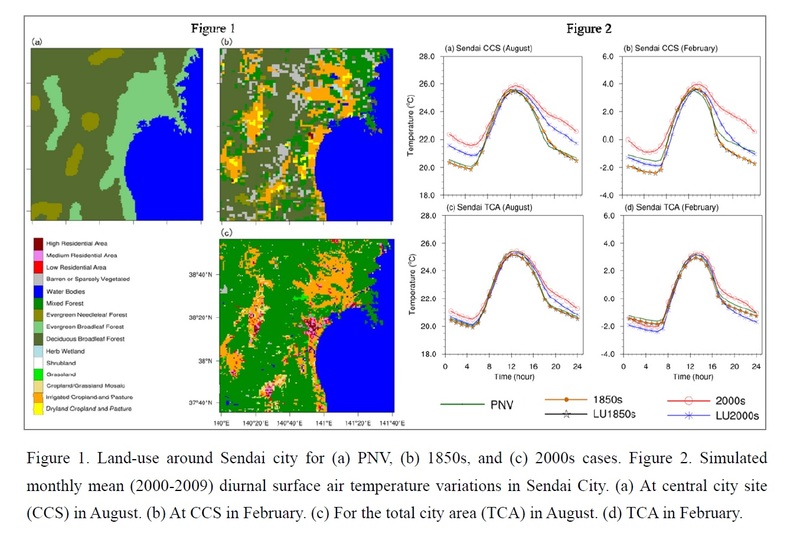 Hirose, H., S. Shige, M. K. Yamamoto, and A. Higuchi, 2019: High temporal rainfall estimations from Himawari-8 multiband observations using the random-forest machine-learning method. J. Meteor. Soc. Japan, 97, https://doi.org/10.2151/jmsj.2019-040. Plain Language Summary: The Himawari-8 Rainfall estimation Algorithm (HRA) was developed by using the Random Forest (RF) machine-learning method. Training data is obtained from an Infrared (IR) radiometer of a third-generation geostationary meteorological satellite (GEO), Himawari-8, and Ku-band precipitation radar on board the Global Precipitation Measurement (GPM) core observatory. 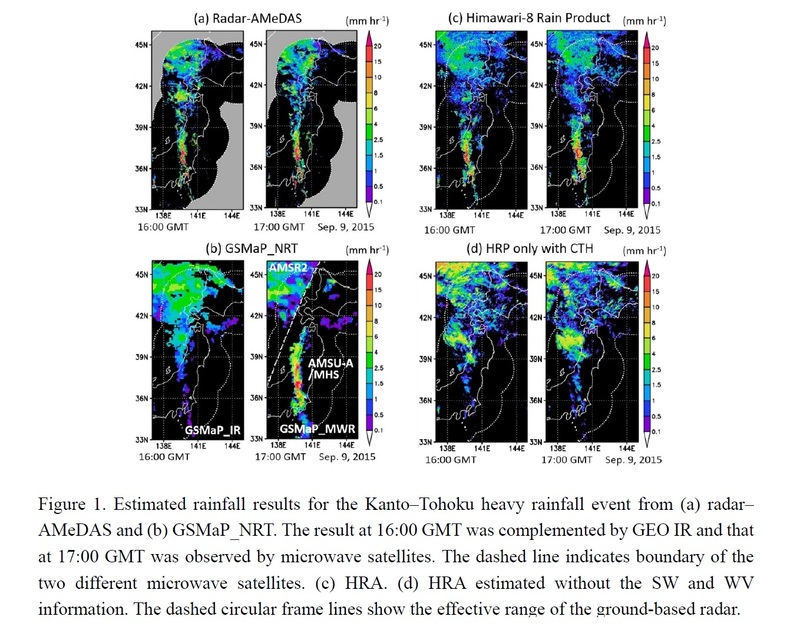 HRA could estimate heavy rainfall from warm-type precipitating clouds in Kanto-Tohoku heavy rainfall events although the Global Satellite Mapping of Precipitation (GSMaP_NRT) could not estimate such heavy rainfall when microwave satellites were unavailable. 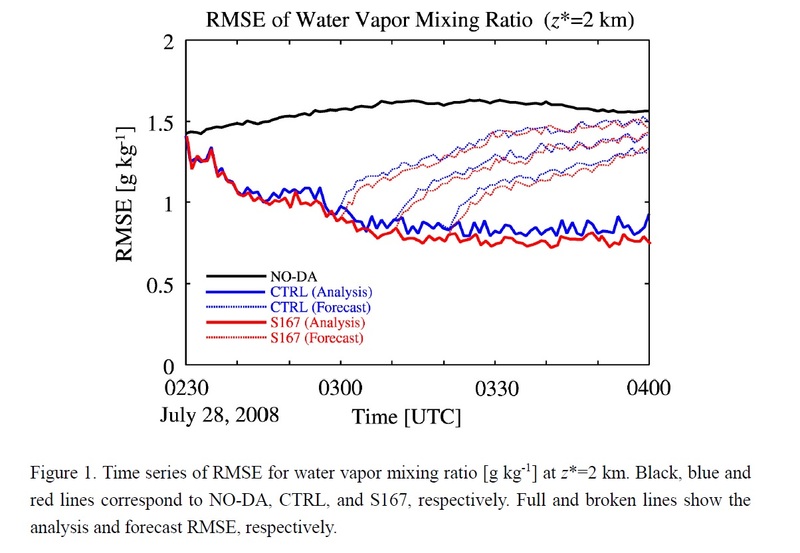 We introduce a novel rainfall-estimating algorithm only from GEO IR observations, called HRA. A statistical analysis showed that the warm-type heavy rain seen in the Asian monsoon region occurred frequently when there were small BT differences between the 6.9-μm and 7.3-μm of water vapor bands (ΔT6.9–7.3), which is first to be analyzed by GEO after the launch of Himawari-8. 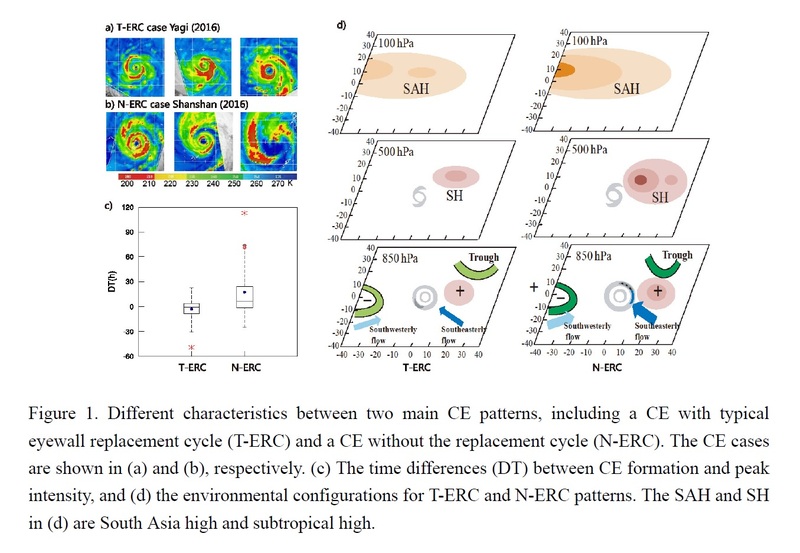 Zhao, H., L. Wu, C. Wang, and P. J. Klotzbach, 2019: Consistent late onset of the western North Pacific tropical cyclone season following major El Niño events. J. Meteor. Soc. Japan, 97, https://doi.org/10.2151/jmsj.2019-039. Plain Language Summary: An accurate prediction of the onset date of an active western North Pacific (WNP) tropical cyclone (TC) season onset (TCSO) is important for planning that can prevent loss of life and property from TC-associated hazards. However, most prior studies have focused on variations of TC frequency, intensity, and track over the WNP, while variability of the WNP TCSO has been relatively less studied. This study finds the relationship between TCSO and sea surface temperature (SST) underwent an interdecadal change in the late 1990s, likely due to a climate shift that occurred around that time. An observed significant correlation between TCSO and SST before the late 1990s and has been insignificant since that time. Our results suggest that the relationship between ENSO and TCSO during the satellite era experiences an inter-decadal change in the late 1990s, at a time when other studies have also indicated a climate regime shift. Our results suggest that changes in the SSTA pattern over the tropical Indo-Pacific sector associated with major El Niño events play an important role in controlling the extremely late TCSO over the WNP basin. Our results indicate that the changing influence of moderate El Niño events on TCSO before and since the late 1990s largely contribute to the inter-decadal change of the ENSO-TCSO relationship. 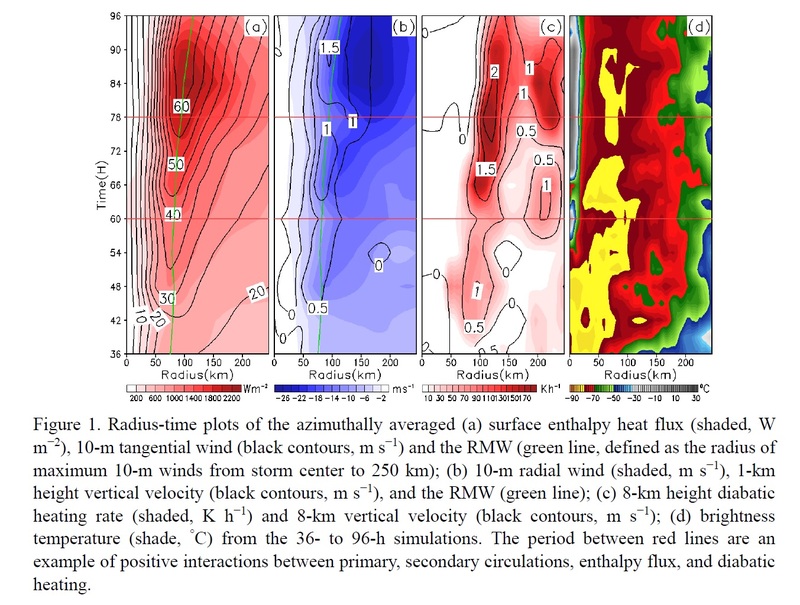 Iqbal, W., A. Hannachi, T. Hirooka, L. Chafik, and Y. Harada, 2019: Troposphere-stratosphere dynamical coupling in regard to the North Atlantic eddy-driven jet variability. J. Meteor. Soc. Japan, 97, https://doi.org/10.2151/jmsj.2019-037. Plain Language Summary: Better dynamical understanding of interactions between the troposphere and the stratosphere, potentially will lead to improved weather predictability. This study explores the dynamical association between three preferred latitudinal positions of the North Atlantic eddy-driven jet and the stratospheric polar vortex dynamics. It has been shown that there exists significant relationship between the central mode of the North Atlantic jet and upward wave propagation. The JRA-55 reanalysis diagnostics for latitudinal positions of the North Atlantic eddy-driven jet are consistent with other re-analysis data sets. There is a lead time of about 17 to 20 days for the North Atlantic eddy-driven jet to be equatorward of its climatological position, prior to onset of a major sudden stratospheric warming event. The central mode of the North Atlantic eddy-driven jet has significantly higher upward wave activity associated to WN2. Shin, U., T.-Y. 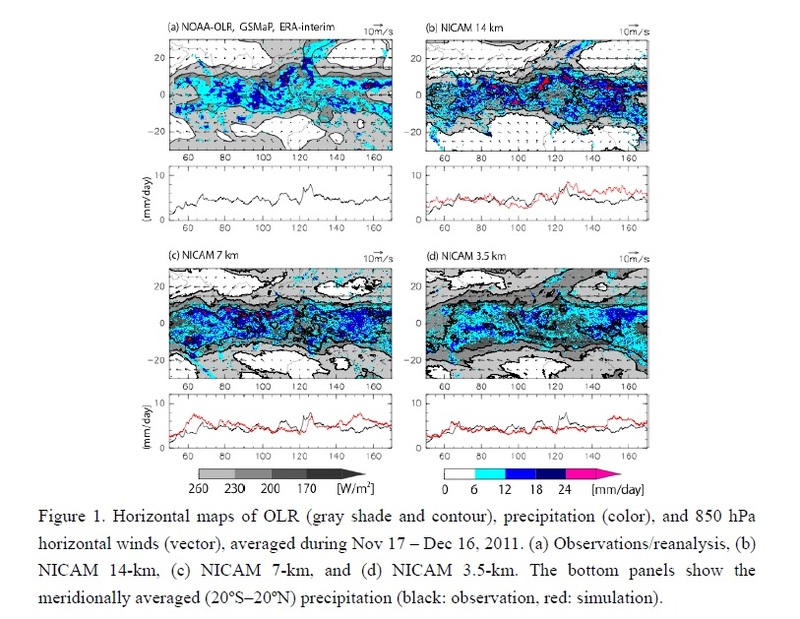 Lee, and S.-H. Park, 2019: Environment and processes for heavy rainfall in the early morning over the Korean peninsula during episodes of cloud clusters associated with mesoscale troughs. J. Meteor. Soc. Japan, 97, https://doi.org/10.2151/jmsj.2019-036. Plain Language Summary: An investigation has been carried out using rainfall observation data, National Centers for Environmental Prediction (NCEP) Climate Forecast System Reanalysis (CFSR) analysis and forecast data to explain the environment and processes that lead to heavy rainfall in the early morning over the Korean peninsula during episodes of cloud clusters (CCs) associated with mesoscale troughs (CCMTs). 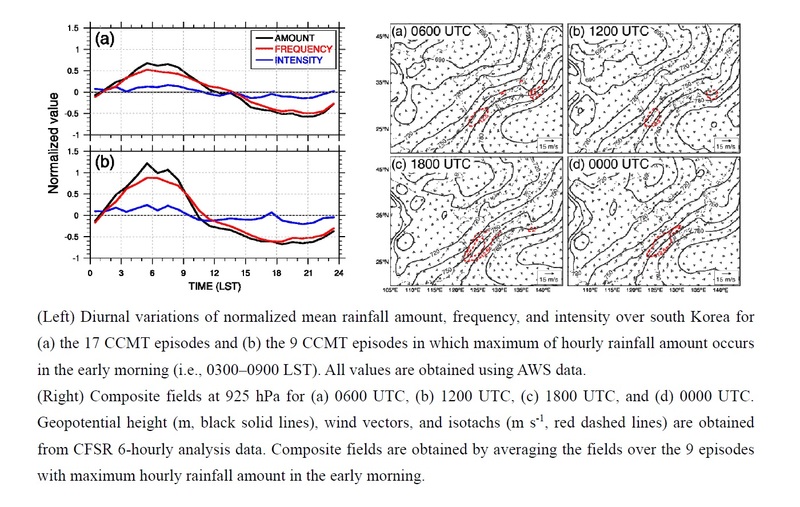 For this study, nine episodes with maximum hourly rainfall amount in the early morning (i.e., 0300–0900 LST) are selected from seventeen heavy-rainfall episodes associated with CCMTs during 2001–2011. Case studies on two episodes have revealed that, for both episodes, the growth of the strong southwesterly band (SWB; an area with wind speeds > 12.5 m s-1) over the East China Sea is found to be the key processes for heavy rainfall in the early morning over the southwestern Korean peninsula. A mechanism for the SWB growth is presented in this paper. Furthermore, generality of the major results from the two case studies is verified using the results obtained for the composite fields of the 9 CCMT episodes. 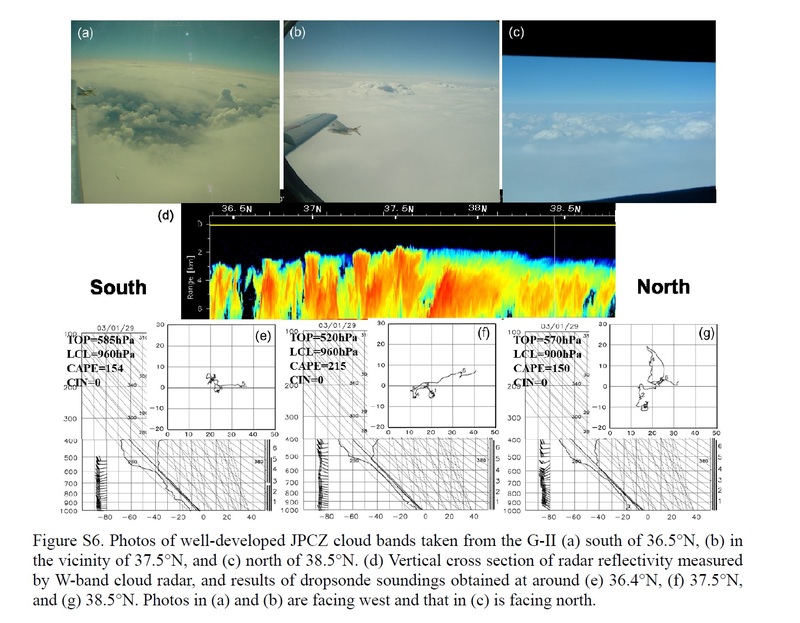 Seguchi, T., S. Iwasaki, M. Kamogawa, T. Ushiyama, and H. Okamoto, 2019: Observation of jumping cirrus with ground-based cameras, radiosonde, and Himawari-8. J. Meteor. Soc. Japan, 97, https://doi.org/10.2151/jmsj.2019-033. 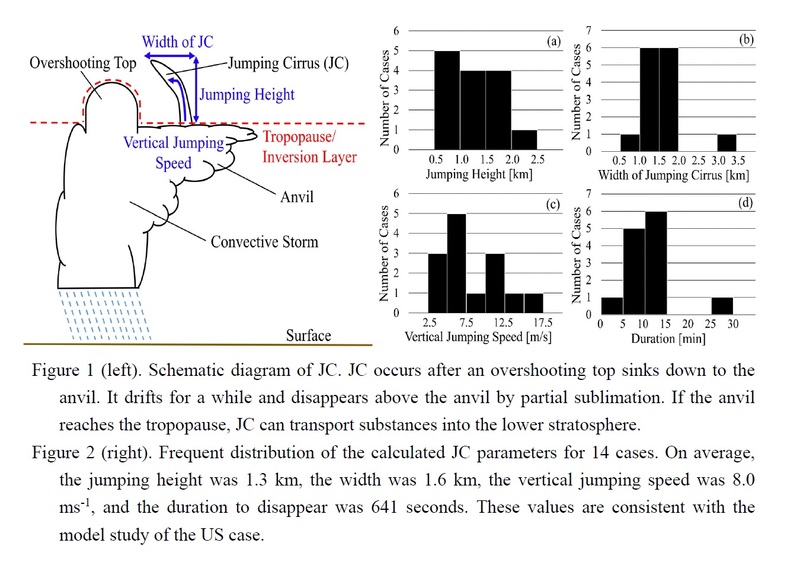 Plain Language Summary: This is the first study where jumping cirrus (JC), a cirriform cloud which literally jumps up and drifts away at the top of anvil of deep convective clouds, is analyzed based on the observation with ground-based visible cameras. Combined with a star chart, infrared band of Himawari-8, and radiosonde, JC’s size, timescale, and environmental atmosphere were investigated for 14 cases during the summer in the Kanto area, Japan. The results showed that even if the underlying convection is relatively weak, JC can occur and 3 cases of JC entered the lower stratosphere. JC is likely to moisten the lower stratosphere by sublimation and contribute to the estimation of stratospheric water vapor. Compared with the US case reproduced by a model simulation, the JC’s height, vertical speed, and duration shows similar scales. On the other hand, all the cases occurred from relatively smaller cumulonimbus which stems from smaller convective available potential energy (CAPE). There was no correlation between JC parameters and environmental atmospheric parameters. 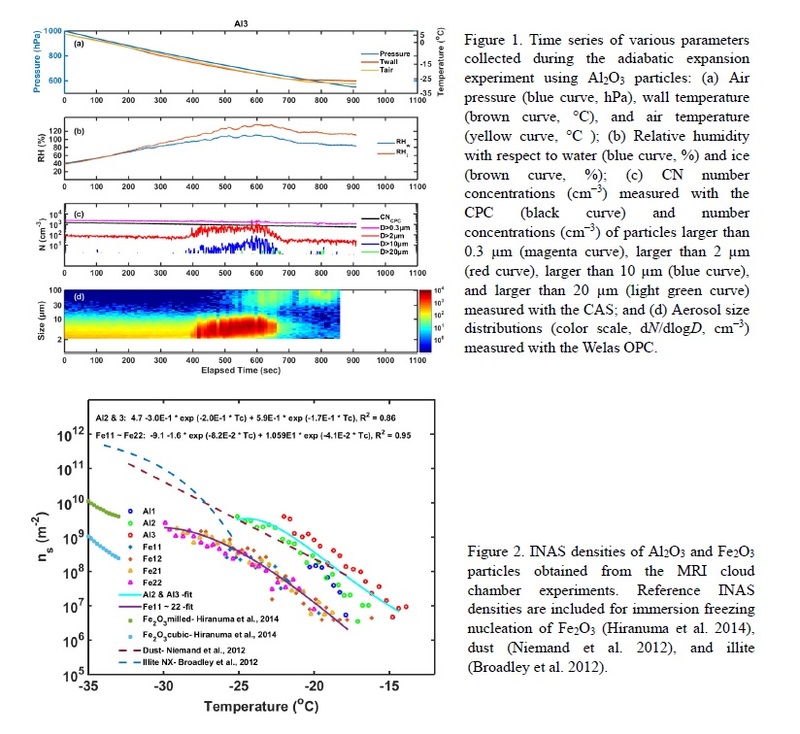 Kuo, T.-H., M. Murakami, T. Tajiri, and N. Orikasa, 2019: Cloud condensation nuclei and immersion freezing abilities of Al2O3 and Fe2O3 particles measured with the Meteorological Research Institute's cloud simulation chamber. J. Meteor. Soc. Japan, 97, https://doi.org/10.2151/jmsj.2019-032. Plain Language Summary: Surrogates of ambient aluminum oxide and iron oxide particles, which have been observed frequently and in high concentrations in the atmosphere and are thought to influence aerosol–cloud interactions, were investigated for their physico-chemical properties such as their size distribution and abilities to act as CCN and INPs, using the Meteorological Research Institute’s (MRI) cloud simulation chamber and an array of aerosol instruments. Hygroscopicity parameter (κ-value) of Al2O3 and Fe2O3 particles ranged from 0.01 to 0.03. In the cloud simulation chamber experiments, Al2O3 and Fe2O3 particles continuously nucleated ice crystals via immersion freezing at temperatures below −14°C and −20°C, respectively. INAS density of Al2O3 was 4 × 109 m−2 at −23°C and was one or more orders of magnitude greater than that of Fe2O3. INAS densities of both metal oxides were comparable to those of surrogates of mineral dust and other atmospheric INPs. Simultaneous CFDC-type INC measurements showed considerably smaller INAS densities for both metal oxides, suggesting that only a portion of the ice nucleation sites can be activated in the CFDC-type INC when their nucleation rate is low. 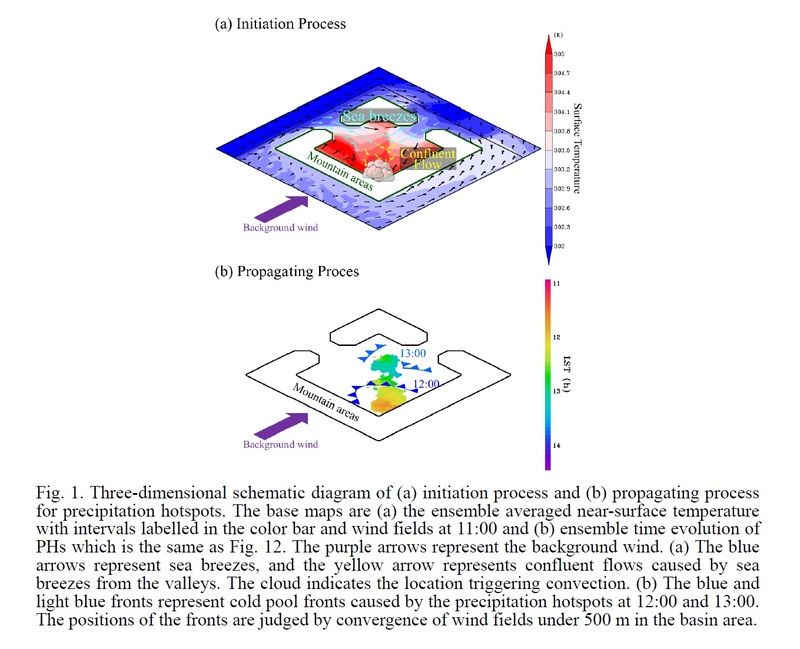 Saunders, P., Y. Yu, and Z. Pu, 2019: Sensitivity of numerical simulations of Hurricane Joaquin (2015) to cumulus parameterization schemes: Implications for processes controlling a hairpin turn in the track. J. Meteor. Soc. Japan, 97, https://doi.org/10.2151/jmsj.2019-030. Plain Language Summary: Hurricane Joaquin, a notable hurricane over the Atlantic Ocean in 2015, is studied with emphasis on its unique hairpin turn that occurred between 2100 UTC 1 October and 0600 UTC 2 October 2015. A series of mesoscale high-resolution numerical simulations are performed with an advanced research version of the Weather Research and Forecasting (WRF) model. Results indicate that middle- to upper-level steering flows are crucial in influencing Joaquin’s track. The middle-level blocking high also plays a vital role in Joaquin’s movement. Specifically, the asymmetry and local absolute vorticity tendency over the inner-core region and its vicinity has a strong implication for Joaquin’s hairpin turn. The numerical simulation of Hurricane Joaquin’s track is highly sensitive to the choice of cumulus scheme in the WRF model. The middle- to upper-level steering flows and the middle-level blocking high are crucial in influencing Joaquin’s track. The asymmetry and local absolute vorticity tendency over the inner-core region and its vicinity has a strong implication for Joaquin’s hairpin turn. 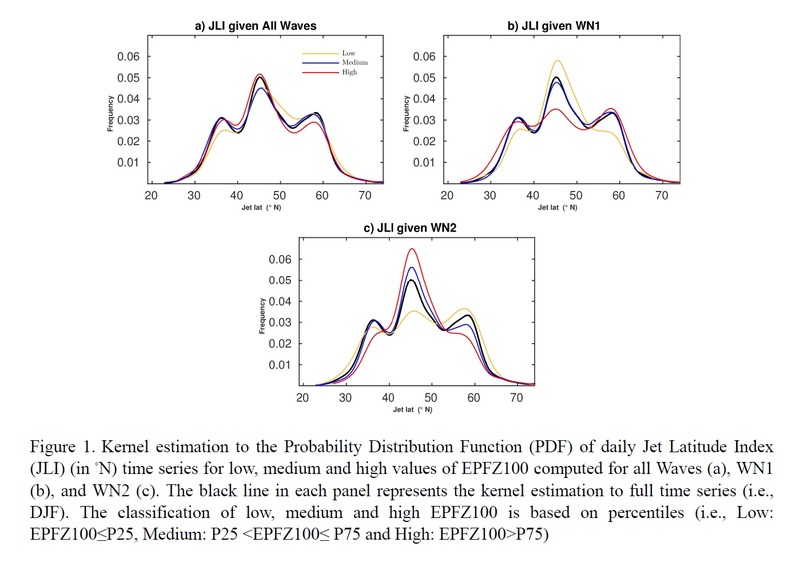 Lim, J., and H.-M. Park, 2019: H-infinity filtering for bias correction in post-processing of numerical weather prediction. J. Meteor. Soc. Japan, 97, https://doi.org/10.2151/jmsj.2019-041. Plain Language Summary: In this paper, we propose an H-infinity filtering approach for the prediction of bias in post-processing of past predictions and past measurements regarding weather forecast. The proposed H-infinity filtering adopts minimax strategy. The proposed H-infinity filtering approach minimizes maximum possible errors whereas a recently proposed approach that adopts the Kalman filtering (KF) minimizes the mean square errors. The proposed approach outperforms the method based on the KF with less complexity and no prior noise information. 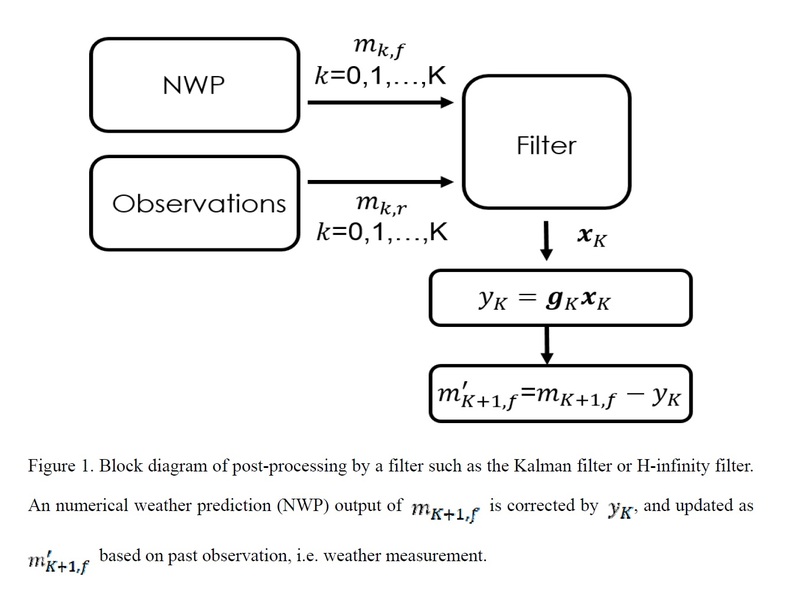 This approach can be applied for prediction of any meteorological parameters as long as NWP is employed. Miyakawa, T., and M. Miura, 2019: Resolution dependencies of tropical convection in a global cloud/cloud-system resolving model. J. Meteor. Soc. Japan, 97, https://doi.org/10.2151/jmsj.2019-034. Plain Language Summary: Global non-hydrostatic simulations using cloud/cloud-system resolving horizontal meshes of 3.5-, 7-, and 14-km produce remarkably different amount of clouds in the tropics despite identical cloud-microphysics applied. The tropical mean upward motion, bounded by global scale radiative balance, is insensitive to the model resolution. However, it is realized by smaller and stronger updrafts in higher resolution models, resulting in a shorter residence time of air parcels within the updrafts, causing more cloud particles to survive without falling out as precipitation. Higher resolution simulations produce more high-clouds because shorter residence time of air parcels within updrafts allows more cloud-ice particles to survive without precipitating out. The increase of high-clouds is followed by a warming of the troposphere, which results in an increase in the column water vapor and an elevation of the freezing level. A Madden-Julian oscillation event was reproduced in the 3.5- and 14-km mesh simulations with as similar propagation speed, but with weaker associated circulation in the 3.5-km simulation.